Nizar Bouabdallah received the B.S. degree in telecommunications engineering from Ecole Superieur des Communications (Sup'Com), Tunis, Tunisia, in 2001, and the M.S. and Ph.D. degrees in networking and computer science from the University of Paris VI, Paris, France, in 2002 and 2004, respectively. 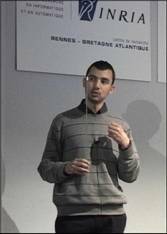 He also received the HDR degree (Habilitation � Diriger des Recherches) in computer science from the University de Rennes 1 in 2009. He joined Alcatel Research Laboratories, Marcoussis, France, from 2002 to 2004, while working on his Ph.D. degree. In 2005, he was with the North Carolina State University, Raleigh, NC, USA, as a Postdoctoral Fellow. He is currently a researcher at INRIA (Institut National de Recherche en Informatique et en Automatique). In 2007, he spent six months as a Visiting Researcher at the School of Computer Science, University of Waterloo, Waterloo, ON, Canada. His research interests include wireless mesh and sensor networks, optical networking, resource allocation under QoS, network planning and modeling, as well as performance evaluation. High-Performance Networks; Wireless and Mobile Networks: Wireless Mesh Networks, Wireless Sensor Networks, Cognitive-Radio Networks; Optical Networking; Resource Allocation under QoS; Performance Evaluation.